LITTLE DOT: She is known as the ‘dot lady’. She reminds me of a 1950’s Harvey comic book character by the same name. She haunts Greenwich Village around 6th Avenue near 8th Street. ‘Dot’ will rummage through the local garbage to find any in tact items she can and then obsessively paints dots on the things she finds…including herself. Her ‘paint’? Diluted Pepto-Bismol! At night she tries to sell her ‘art’, but in the day time – I was told not to get too close to her, or she’ll get angry and dash off. . . This entry was posted on August 24, 2012 by newyorkcityinthewitofaneye. 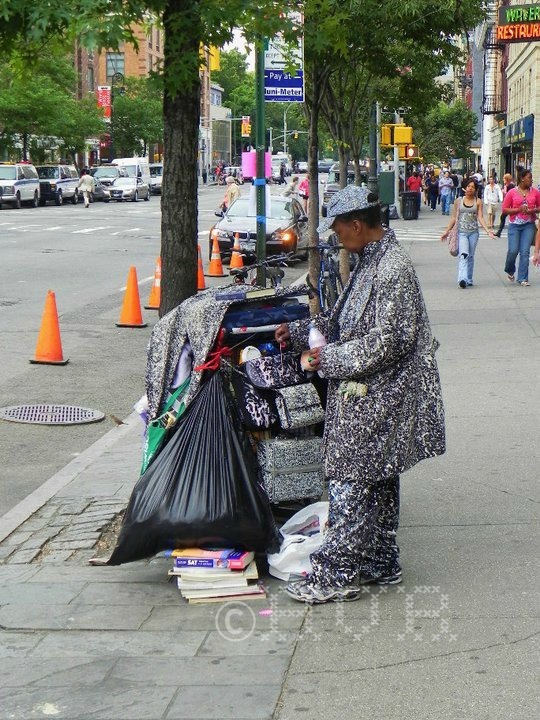 It was filed under DAILY PHOTOS WITH STORIES OF NEW YORK CITY and was tagged with Greenwich Village, Hans Von Rittern, Harvey comics, homeless, Little Dot, Manhattan, New York City, Pepto-Bismol, street art, street artist. Love this! You need to buy one of her pieces next time you see her at night.